The body of Staff Sergeant Dyson Mayao, a Malawi Defence Force ((MDF) soldier who was killed by rebels in the Democratic Republic of Congo (DRC) last week, was laid to rest yesterday at Ntata Village, Traditional Authority Mabuka in Mulanje. Mayao was part of the United Nations (UN) Force Intervention Brigade comprising battalions from Mal awi, Tanzania and South Africa and is being commanded by MDF officer Brigadier General Vincent Nundwe. 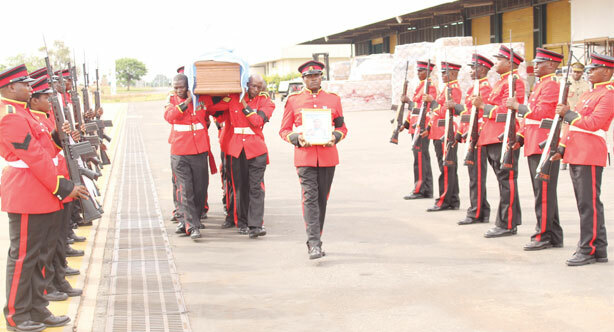 A sombre mood engulfed the cargo section of Kamuzu International Airport (KIA) on Saturday where the late Mayao’s body came through in a brown casket draped in a blue UN cloth. A brief sermon was held, led by MDF Chaplain Captain Reverend Kamponda, before a military aircraft carried Mayao’s body to Zomba airbase from where they proceeded to his home village. So, finally a soldier is back home from the battlefield, having fought a good fight, shedding his blood to savage peace for hopeless citizens of the central African nation, offering the highest level of human sacrifice: life. To his family, a husband and father is gone—hope has withered and life has returned to the lowest level. But Deputy Minister of Defence, Malison Ndau, who received Mayao’s body at KIA on behalf of government, and MDF Deputy Commander Lieutenant General Griffin Supuni-Phiri assured the family of continued support. Both Ndau and Supuni- Phiri admitted that the pursuit of peace is a difficult cause where obstacles are inevitable. In his remarks, Supuni- Phiri said since soldiers were deployed in DRC to fight the armed groups, there has been a lot of improvement in areas which were otherwise ravaged by the rebels. According to MDF, the late Mayao was born in 1965.